Many Progressive Insurance Automotive X PRIZE teams continue to make incredible progress since the conclusion of the competition. Cincinnati-based Amp Electric Vehicles is busy making deals to continue their work getting Amp EV conversions on the road in the near term. Amp recently added Jim Taylor, ex-CEO of Hummer, to its board of directors. They also rounded out their already well-experienced advisory committee by adding Larry Lyons (ex-Chrysler) and Ronald Sobrero (General Motors). Since the competition's end, Amp has also received impressive media coverage from the New York Times, USA Today, Motor Trend, and Consumer Reports. If you're not familiar with Amp's philosophy about conversion vehicles, watch below as Amp CEO, Steve Burns, explains the company's viewpoint, and introduces their new Amp Electric Chevy Equinox in an Electric Vehicles Forum interview. While the Progressive Insurance Automotive X PRIZE is over, its legacy lives on through the teams who took part in the competition. Teams will provide updates from time-to-time so that we may share their post-competition experiences and achievements. This latest entry is from Kevin Smith, the leader of Mainstream team, Illuminati Motor Works. Although the Progressive Insurance Automotive X PRIZE has come to a close, Illuminati Motor Works (IMW) is continuing our journey spurred on by this competition. And, I should note, that although the competition is over, our involvement with the X PRIZE Foundation has not ended. The foundation is continuing its work with many of the teams in different ways, including: vehicle testing and engineering support/design through the voucher program with the DOE and Roush; continuing press and PR support; and advising teams of available promotional opportunities to display their vehicles at various car shows and events across the country. I know everyone that’s been following us likes to be kept informed of what’s going on, and when we don’t post, they sometimes feel like we’ve deserted them. (I know that because I feel the same way…and I should really be the one that knows what’s going on.) But, when post are no longer a ‘have to' (like homework), you tend not to get around to them. It feels more like being a kid and having to clean your room (no offense to the 16.3 people out there that actually like cleaning their rooms), and it’s one of those Leave It to Beaver, "Ah gee, Mom, do I have to?" type of feelings…well, until you get typing. Then, anyone who’s followed, read, watched, listened, or grown old as I go on my most recent tangent, knows that I don’t really have a problem going on for a bit. In fact, here’s some of that super-secret inside-information that I’m probably not supposed to tell. We’re still working out the details and stuff (those are both highly technical terms, for definitions please visit our other posts) with Roush and the X PRIZE Foundation for the engineering work and testing to be performed on Seven. However, these things don’t just happen overnight (kind of like my blogs, and "We’ll keep you posted as things progress."). Work on Seven continues. We’ve done a lot more testing and refining of the battery pack (a.k.a balancing and cleaning, some stuff like that, you know, the normal EV blog post type stuff), but we've also been doing some stuff (there's that technical term again) that no other EV has ever done, well, that we know of. Very few electric cars have a range in excess of 100 miles on a charge, let alone 100 + miles while pulling a trailer. My wife thought I was nuts for trying it -- no chase vehicle, no planned places to stop to recharge, up until 2 a.m. the night before trying to modify a trailer, add wiring for trailer lights and get Seven charged for the trip...then go. Well, she's usually right, but nuts or not, we made it with charge to spare (not a lot to spare, mind you). So, what am I getting at? Where does this leave us? With the Progressive Insurance Automotive X PRIZE over, and having very little opportunity to raise funds to start manufacturing Sevens, there is still one avenue. Starting this next spring we're taking on Guinness! The Guinness Book of World Records, that is. We're going to set as many records as possible. Maybe we'll even set a new number of records held by a single vehicle, definitely for any EV. And, again, we'll do it all on a limited budget. I mean, if you think about it, anyone should be able to set a record if they throw enough money at it. The real challenge is showing it can be done without spending $5million, or even $1million. And, that’s exactly what we’re going to do -- continue the work that the X PRIZE started, and show the world, and keep showing them, just what is possible. We’ll show them by doing! And, not just once, but as many times as humanly possible. And, we’ll keep breaking records until everybody has heard and seen what an electric car can do. We will break records until everyone knows that it is possible to have an efficient vehicle that also meets or exceeds current production vehicle standards. We will break records until Seven is a household name, and those households have not just asked, but demanded, better performance from their vehicles. We'll break records until those households are all driving Sevens, Eights, and Nines, no matter who is manufacturing them, because the public will know what is possible, and they will hold our political leaders accountable to make the changes necessary for our energy independent future. It is time we make a stand. Illuminati Motor Works has accepted the challenge to lead the way. Alternative (Side-By-Side) Class winner, Li-ion Motors Corp. is set to unveil its newest vehicle today at the 2010 SEMA convention in Las Vegas, NV. This new vehicle, named Inizio, will be on display alongside the competition-winning vehicle, WAVE II, for the duration of the 2010 SEMA convention (November 1st - 5th). Inizio is a sleek sports car that was built from the ground-up, just like the WAVE II. In fact, many of the same engineers that designed WAVE II have been hard at work developing this powerful electric sports car. "We are extremely excited about this vehicle," says team leader, Ron Cerven. "This is the most awesome looking car, and it uses many of the same core components as the WAVE II including the battery management system, battery cell technology, and the heating and cooling systems." The lithium-ion battery packs used in both vehicles can recharge in less than eight hours, depending on the current, and have an approximated range of up to 250 miles. Sports car enthusiasts will be glad to know that Li-ion expects the Inizio to reach between 170 and 200 mph, as well as clocking zero to 60 in 3.4 seconds. The production chassis will also have removable battery pods so that the batteries can ultimately be replaced or switched out for more powerful pods. The good news for Li-ion and 100 MPGe enthusiasts continues after SEMA, as both the Inizio and the WAVE II will ship to California to begin their federal motor vehicle safety standards pre-certification. 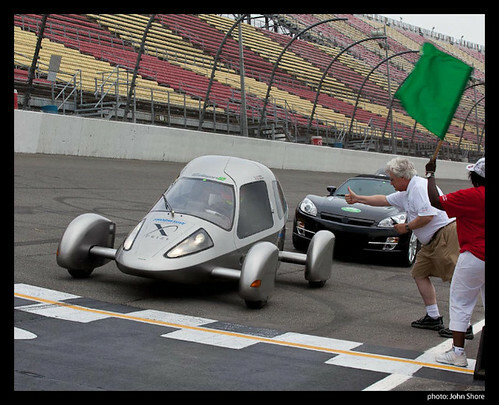 "I feel like we really do represent what the Progressive Automotive X PRIZE competition is all about," says Ron. "We are getting these cars out into the real world." WIKISPEED team leader, Joe Justice, found a way to merge his work and personal passion in order to follow a vision that he has for creating safe, energy efficient vehicles. As a business consultant in Lean engineering and Agile project management, Joe visits businesses to help them reduce waste in their daily work. He has consulted for the oil industry, the health care industry, state and federal government, and currently consults at the largest non-profit foundation in the world. Pursuing his passion, in 2006 Joe was tuning production cars for speed. Like many car enthusiasts, he realized that by reducing the weight of the car, he not only improved acceleration and handling, but he improved fuel economy as well. Joe began reducing vehicle weight aggressively, and ultimately abandoned production car frames to create something much lighter. Furthering his commitment to this pursuit, Joe studied road legal requirements, founded a certified automotive manufacturing business and focused on reducing the weight of his vehicle while retaining the safety standards and other requirements for road legal use. At this same time, Joe became involved in Lean engineering and Agile project management, which reduced the cost and complexity of his designs and reduced the cost of partnering with vendors. 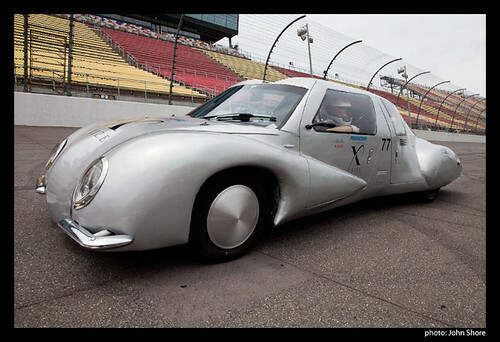 In 2008, with the announcement of the Progressive Insurance Automotive X PRIZE, Joe formed WIKISPEED, which is comprised of a team of volunteers and vendors who are committed to creating100 MPGe vehicles. To build his team, Joe solicited experts in automotive tuning, project management, materials engineering, automotive manufacturing, automotive design, automotive safety, racing, and even philosophy. When he is not able to find a volunteer with a specific expertise, he calculates the expense to either hire someone at a respectable industry rate or train a team volunteer to a valuable skilled level. As a result, WIKISPEED is comprised of a changing mix of contractors and volunteers. One of the greatest challenges that WIKISPEED has experienced during the competition involves balancing its collaborative and vehicle development philosophies with the confidentiality required to compete in the Progressive Automotive X PRIZE. In addition to producing a vehicle for the Progressive Automotive X PRIZE, team members of WIKISPEED have a history of innovation. Members have previously innovated composite 3d printing methods and prototyped simplified robotic bipedal walking systems. Currently, in relation to their vehicle, they are developing a minimum cost, modular road legal vehicle. Simultaneously, they are also researching vaccine deployments in developing countries and remote zero-environmental-footprint medical centers. No matter what the outcome of the Progressive Insurance Automotive X PRIZE, SABA Motors’ team leader, Simon Saba, will have no regrets. Although he does not have a background in automotive, he knew that the time was now to take advantage of an opportunity that he believes will never come again. Simon, a mechanical engineer, who works in the field of lasers and fiber optics technology, followed his entrepreneurial spirit when he heard about the Progressive Automotive X PRIZE. Understanding the technical and financial challenges of the competition, he nevertheless jumped in and has not looked back. Simon believes that now is the perfect time for automotive innovation and the rise of challengers to the major OEMs. He holds that the new emphasis on green technology, moving away from fossil fuels, improving efficiency, the relative newness of this technology to the OEMs, the eco-friendly government, and the new public awareness of environmental issues creates a perfect storm. Simon views his lack of direct automotive experience as a competitive advantage. Calling on his experience with Kevlar and carbon fiber, he created a proprietary new body design that struck the balance that he was looking for between mass produce-able but rigid, safe, lightweight and affordable. Although there were many choices in exotic light weight materials, he settled on using a significant amount of aluminum because of the abundance and low cost that it offers. When he faces challenges, he identifies experts in the area and calls upon them to get their input and insight. Simon has relocated his company to the Fastlane to Green Technology business incubator located at Club Auto Sport in the heart of Silicon Valley. His involvement with Club Auto Sport, in San Jose, California, has brought him great returns. Its membership, made up of automotive experts, enthusiasts and racers, have supported Simon’s efforts and helped put him in touch with other knowledge sources that have proven invaluable. While showcasing his Carbon Zero Roadster for the auto club at Laguna Seca, he was invited to display his vehicle at the Global Climate Summit in Southern California. There. He had the opportunity to show and discuss the roadster to Governors Schwarzenegger of California, Gregoire of Washington and Kulongoski of Oregon.